Sometimes packaging delights us; sometimes it turns us off; sometimes it sadly becomes more of a focus than the liquid it’s intended to position, enhance and display… Rarely does it confuse. But that’s where Gordon and MacPhail’s Mortlach 75 year old packaging has left me – utterly confused. I’m not saying it’s bad per se, just a little left of field, a bit odd and probably not that sensible if the truth be told. The recent Whisky Auctioneer whisky sale saw a bottle of the oldest Scotch in the world sell for the not insignificant sum of £17,800. Included in the sale was the leather travel/presentation bag. I have nothing against leather travel bags, I’ve owned one for many years and it’s been a welcome companion on many a trip… But would I stuff nearly twenty grands worth of Scotch and crystal decanter inside it and haul it over my shoulder? The concept seems about as sensible as popping into Lady Gaga’s meat dress and wandering round the Maasai Mara shouting “here Lion, Lion… here boy”. Maybe the inside of the bag has significant steel and Kevlar reinforcement? At least it’s different! Odd… granted, but different. Makes traveling with you twenty grand bottle of Scotch a breeze! Anyway, moving from packaging to prices as is more the focus here; there were some huge new records achieved at last week’s Whisky Auctioneer sale. Macallan – A market divided. As auction values for more modern releases and many Macallan ‘drinkers’ splutter and falter like an asthmatic steam train ascending Everest, many are becoming available at auction for significantly less that you’d pay at retail (Rare Cask for £135 at auction). On the flip side of this crumbling coin is the golden face of the ‘old’ bottles. The older vintage 18 and 25 year old’s are absolutely flying. Values are increasing at an unprecedented rate. The 18’s have already increased by 24.69% this year and the 25 year old’s have increased by 19.35%. April’s Rare Whisky 101 month-end charts were off the scale and that growth looks to be accelerating. As with the vast Karuizawa gains seen through early 2015, we’re wondering if the market is becoming overheated. Certainly, the pace of these increases cannot be maintained. Three of the 18 year olds sold at this auction achieved fresh new records – the 1970 hit £1,050, a bottle of 1974 sold for £975 and the 1978 made £825. All were selling for around a third of those prices as recently as 2013. Islay continues to ride high. Yet again, older rarer bottles from Islay made big money. I remember being sat in the auction room at Bonhams (Edinburgh) in 2010 and chatting in hushed tones to a friend as the auction moved along. Almost exactly when I’d finished talking, the hammer fell on a bottle I couldn’t believe I missed. £120 took a bottle of 1972 27 year old Bowmore… A snip… and I missed it because I was chewing the fat over Lyne arm angles, secondary fermentation or some other utterly geeky stuff. Like my old school reports – pay more attention! Especially noting that bottle sold for £858 at last week’s Whisky Auctioneer sale. White Horse bottled Lagavulin seems to be in ever increasing demand. £230 took a bottle to nearly double its recent trading range… Maybe there’s panic in them there hills? Might 16 turn to eight then turns to NAS?! I suspect not to be fair, but who knows. A bottle of Murray McDavid bottled 1979 Lagavulin also shone through as a clear winner managing £1,000 for the first time. Until the end of 2013 this bottle had never sold for more than £200 at auction. Bruichladdich saw a bottle of its 40 year old make the most expensive bottle of ‘Laddie at auction in the UK. A respect-worthy £1750 took it past a previous best of £1550. From a silent stills perspective. The big movement was seen from independent bottlers. A brace of 1972 vintage Brora’s from Douglas Laing went expectedly berserk. The Old and Rare 29 year old managed £2,350, massively ahead of its previous UK sale price of £500 (that was expensive in 2010!) and the 30 year old bottled for The Whisky Shop hit £1,426, not a record but a superb price noting it was lacking its card tube. Port Ellen had a noticeable lack of bottles at auction but a Connoisseurs Choice 1982/2007 stood out when it fetched £410. All told, last week’s Whisky Auctioneer sale was as buoyant as they come. We’re just keeping a close eye on the rapidly heating vintage Macallan market. For those with a few stashed away, values are clearly increasing; however, I’m not so sure I’d be entering the market in a hurry right now. As always, time will tell. Images courtesy of Whisky Auctioneer. Further buoyancy at Scotch Whisky Auctions recent sale served to cement the positive market sentiment. Age, vintage and rarity continue to be driving forces behind the best performers. Ardbeg’s ever increasingly scarce single casks remained under extreme pressure. One of 453 bottles released from cask 1378, a 1975 vintage released in 2006, fetched £1,150. Just £360 took this bottle in 2009. Younger single casks also shone with a bottle of the 2000 vintage from cask 368 taking a massive £700. With a previous record of £410 in 2015, this looks like a one off spike but is impressive none the less. Adding at least some balance to proceedings, heading down in value was a bottle of Auriverdes ‘bloggers-bullion’ gold bottle. At £1,000 it’s now worth just less than 50% of its first recorded sale of £2,100. Losses aside, £1,000’s still not a drop in the ocean for a free press release bottle. At 40 years old, the 1966 distilled Jura was limited to just 98 bottles and is rarely seen at auction. At this kind of age and with exceptional rarity it’s no surprise to see the bottle hit a new record. In 2008 a bottle sold for £700. In today’s market the value of this scarce bottle has increased by 257% to £2,500. While many of the more familiar releases languished or slipped in value, top end Glenmorangie’s performed well. Throughout 2010 and 2011 Glenmorangie values crashed. We’ve spoken about this frequently as values literally halved over a period of just three short months. While prices have remained depressed for certain limited editions, the older aged/vintage releases have recovered and in some cases excelled. A bottle of 1981 Sauternes finish fetched a frighteningly low £120 in the depths of the ‘Morangie-massacre – Putting those fallow times well and truly behind it now, one sold for a record £720, a bottle of the duty free exclusive 1975/2002 ascended to £430 (Mid-crash this was sat at £122) and topping this heady trio was a bottle of Malaga finish 30 year old which managed £820 (again, just £120 took this bottle mid-crash). Hindsight is 20:20, we all know that; BUT… but, if you’d bought these three bottles in 2011, right at the peak of ‘Morangie-misery, they would have cost £362. In today’s market they would be worth £1,970, a 444% increase. Old vintages also continue to shine. With an all-time low of £150, a G&M bottled 1957 vintage Tamdhu sold for a record £640. The previous record for this bottle was a mere £260 in 2014. With a notable absence of any sort of volume for older vintages, it was scant surprise to see a new record for a 1970/1988 Macallan 18 year old: £920 sealed the bidding, well ahead of its previous best £750. Showing a recovery and renewed demand for rarities, the first release Easter Elchies Cask Selection closed out at £1,100, not an outright record but good progress, especially considering its 2008 release price of £105. Silent stills were, again, visible by their absence. Dipping numbers on the open market are pushing prices ever higher. I remember being beaten at auction in 2011 for a bottle of Brora Silent Stills 1983 18 year old. The enemy (the other bidder) took the price up to £310… there were only two of us bidding by that point… I thought he’d leave at just over £300 so I pushed on to £320. The enemy’s hand went straight back in the air and I remember thinking this is going to go silly. So I let the enemy have it for £330. Maybe I should have taken it a little further as one sold for a mighty £920. Glenugie 32 OB achieved £470, sneaking past a previous best of £450. Glenury Royal 40 year old managed £780, comfortably past a previous best £600 in 2014 and a low of £340 in 2013. Killyloch’s 1967 OB hit £2,000 for the very first time. £1850 was its previous best. With £400 as its all-time low in 2012, that’s some major upside. Port Ellen 9th made £1050, just squeezing ahead of its £1000 previous record. Rosebank’s OB 25 year old Added £20 onto it’s previous best of £620, tipping the scales at £640. In general, I don’t remember seeing such a buoyant start to the year as we’ve seen in 2016. There will be some spikes in-and-among the numbers and some bottles will naturally cool back down… That said, we do still see a continued hardening of prices for the oldest, rarest examples of the best whiskies. Get ‘em while you can?! We’ve said it before and we still maintain – we don’t believe in bubbles. Not with a physical asset anyway. The reason we don’t believe in bubbles is they burst instantly and leave absolutely nothing… With a bubble, everything is gone in an instant. Could that happen with whisky? No, you’ll always have a bottle… More importantly (unless the broader economy implodes and we all go back to cooking on an open fire), do we see Port Ellen 1st release ever settling back to £100 a bottle or a Connoisseurs Choice Kinclaith 1966 ever being sold for its original retail price of £19.74? Again, simply no – no we do not. BUT… do we believe in overheated markets being the subject of a significant correction, protracted slump or even a crash? Absolutely, we have to. Glenmorangie values almost halved within three months through late 2010/early 2011. Their values have now just clawed back their losses to reach pre-crash levels; it’s taken five years for a full recovery. 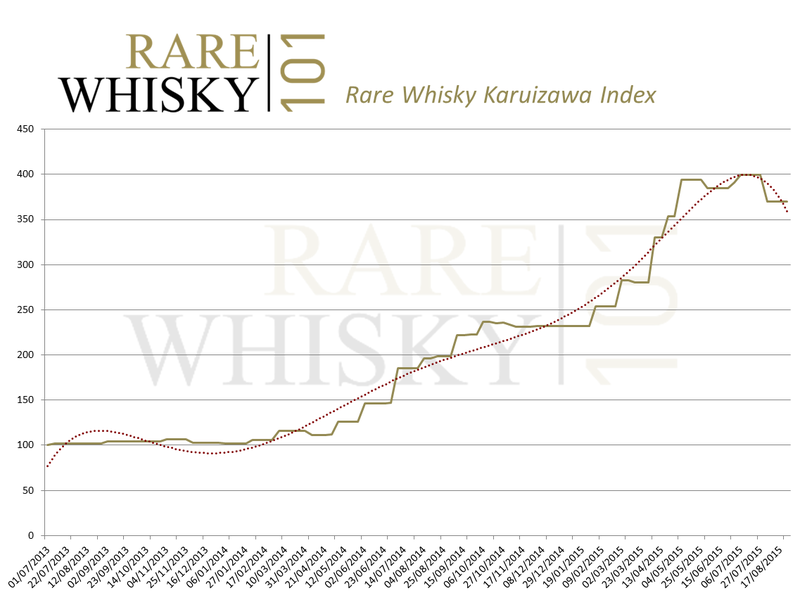 Over recent months, Karuizawa values have increased at a rate the broader whisky market has never seen. The Rare Whisky 101 Kauizawa Index was established on the first of July 2013, so it’s our most recent index. Exactly one year later, the index had increased from its base of 100.00 points to 146.83. That 46.83% increase outstripped Scotch, nothing could compete; but equally that would pale into insignificance compared to the gains we would see over the subsequent 12 months. 146.83 points on the first of July 2014 became a staggering 384.61 twelve months later on the first of July 2015. That’s a 161.94% increase. The index peaked at 399.32 at the end of July this year. From a broader pure cost perspective, two years ago, the single cask 1980’s vintages were selling for between £600 and £800 per bottle (We’re not going to look at original retail prices because, quite frankly, it all gets a bit silly). In many cases these prices are now in the region of £2,500. All this comes at a time when a bottle of 1960 vintage Karuizawa takes the record for the most expensive bottle of Japanese whisky ever sold (Bonhams Hong Kong £77,000). We would like to see a bottle sold at auction in the UK to see how values compare… But even in Hong Kong, hammer prices for certain bottles eased back from previous highs. The 1967 (cask 6426) sold for c£15,000 in May and made c£12,000 at the August sale. The market looks overheated. £2,500 for a bottle of ANYTHING is a massive price to pay. Bottles of 1950 vintage Macallan can still be obtained on the open market for that amount. Karuizawa almost defies logic in terms of the prices being paid. Scant surprise, one may argue, that we’ve now seen a drop in value through just one month by an eye-watering 7.41%. That brings the Karuizawa Index down from its peak 399.32 at the end of July to 369.73 on the 31st of August. It doesn’t look like over-supply’s the culprit – The last six months have seen the number of bottles sold at auction in the UK remain relatively low and August even took a notable step back from July’s high (number of bottles sold – March 70, April 70, May 50, June 41, July 87, August 57). 7.41% is a steep drop in one month, so should we be worried? In our opinion we should realistically expect to see a continued short-term decline in values (at best a period of stability). We’re not expecting anything like the sort of 50% losses Glenmorangie suffered in 2010, however, we do see the current market as being in need of a natural correction before a more uniform pattern of growth is established. As a positive counterbalance to that, we need not forget that Karuizawa is almost gone from the cask and much of the (earlier releases anyway) bottled stock has been drunk. Rarity and quality will absolutely continue to play a vital role in values – and Karuizawa has both in spades. While it’s clearly impossible to know exactly how this will play out in the long run, we would certainly advise caution for those buying at the moment (particularly as an investment). As Karuizawa experiences its most significant drop to date, how has the rest of the market performed? Without exception The Negative indices continued to slide, further polarising the market. The Neg1000 moved down 0.68%, the Neg250 retraced 0.83% and the Neg100 hit a new low of just 31.98 points as it fell 0.56%. The other notable performance was the official Brora index which fell 6.04% through August. The Brora index peaked at 396.63 points in February 2014 and currently stands at 332.15, yielding a peak-to-present-day loss of 16.26%. The Macallan 25-year-old Anniversary Malts took a slight decline through August with the 18-year-old’s remaining flat at zero growth. The remaining indices look relatively stable. Encouragingly, the benchmark Icon100 increased 1.47% and the Apex 1000 moved up by 1.66%. As we move rapidly towards the early winter months of 2015, we head into what is traditionally the busiest time of the year. Supply usually peaks in October/November and with more bottles sure to go under the hammer than ever before, we find ourselves asking what might happen if there’s a Karuizawa late-year sell-off? Can demand keep pace if volumes do rapidly increase or will we see extended losses? We can’t forecast the answer but we will certainly report the results.